River Bluff, as the name might suggest, is Bossier’s premiere riverfront sanctuary. That’s right. This gated community stretches along the lazy Red River, offering residents the opportunity to have the best access to everything it has to offer. Just over the levee, you are transported to a community that is both safe, and relaxing, with curved streets that wind along the river. The homes here range from luxurious mansions and estates, to smaller more affordable houses, with varying styles of architecture and design. River Bluff is located on Benton Rd. in North Bossier, where rural tranquility is still within reach of the city. I-220 is only minutes from the front gate, which provides access throughout the Shreveport-Bossier area. Also nearby is Willis Knighton Bossier, a state of the art medical facility, and some of the best public and private schools are nearby. If you enjoy shopping, it’s minutes to the Louisiana Boardwalk, and even less to all of the shopping and dining along Benton Rd and Airline Dr. Being on the river has its appeal to water sports enthusiasts, anglers or simply those who like to be on the water, and River Bluff is also just a short drive from other recreational areas such as Cypress Black Bayou and Lake Bisteneau. 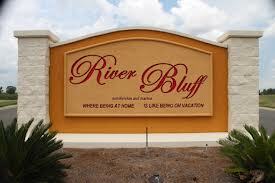 For a unique luxury living experience in North Bossier, visit River Bluff.